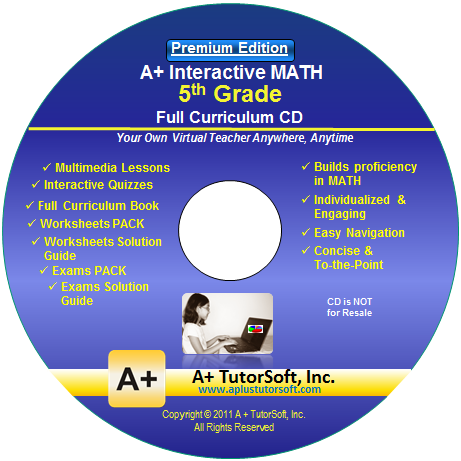 Have you heard of A+ Tutorsoft Math? If not head over to their website and check it out. A+ Tutursoft is a fabulous multi-sensory interactive math program. There are several grade levels available covering math topics from first grade - high-school. Gwyn has been using A+ for a little over a month now and is finally having fun with math (review coming soon). I know things are tough for many families right now. The economy is in slump, many have lost their jobs, insurance prices are on the rise....... Well guess what A+ Tutorsoft wants to help the homeschool community by providing 50 families with curriculum. Head over and nominate a family for the $6,250 giveaway. It's super easy (you can nominate yourself). Any family that does not win will receive a 40% off coupon. You can read more details on the flyer below or just head over the website to enter. 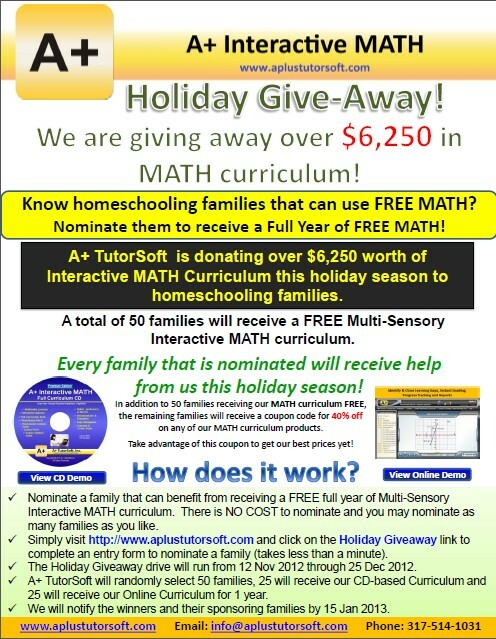 If you are a family in need of math curriculum and would like a nomination leave me a comment or send an email. Entry deadline is December 25th.